When I’m gripped by a remarkably enchanting pedal and have the distinct honor of writing about it, I always have a hard time with the first few words. Like, just now; there was a solid ten minutes of empty space disguised as thought. I mean, we’re talking SPACE. The kind of space that every prog band (mine included) writes masturbatory concept albums about. Big open expanses of nothing, run through by thick gusts of cosmic wind that strip away the comforting cocoon of conscious thought. The kind of space the EarthQuaker Devices Transmisser simulates. And now my train of thought is back. I love playing with EarthQuaker Devices pedals. No matter how many of these weird little rectangles I let into my life I just can’t get enough. It isn’t the unique and well defined branding, or the affordability of every EQD pedal, or even the quake-inducing tone inherent in each lovingly crafted feel machine that does it for me, though these are all contributing factors. What gets me every time is EQD’s insatiable thirst for bending the rules of what sounds good inside of a realistic framework. For example (and to segue into the reason we’re here now,) EarthQuaker recently released a modulated delay as an alternative to their riotously successful Afterneath, a pedal we know as the Transmisser. The Transmisser is a multifaceted reverb with both modulation and filter aspects entwined in it’s DNA, an effect few (if any) builders have attempted. It’s a truly unique effect, and I’m going to talk about it. Warp is a unique system-wide parameter adjustment, affecting the width of the modulation, the depth of the filter, and the length of the decay at once. More on this later. 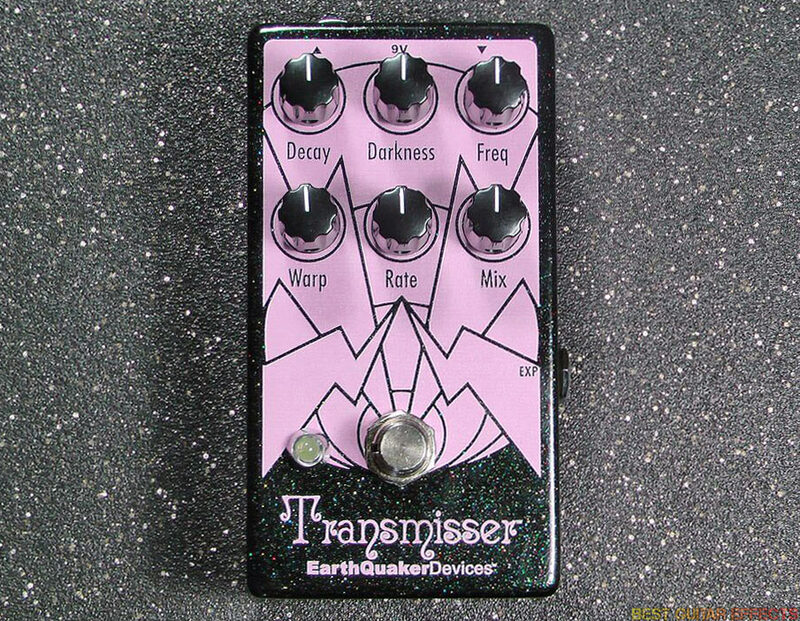 The Transmisser is decorated with a light fuchsia visage of what I can only imagine is EarthQuaker artist Matt Horak’s interpretation of lightning striking a black hole, printed on a sparkling black background. The knobs are tall and thin and the I/O jacks are top-mounted to save space, like most of EQD’s smaller offerings. There is an expression jack on the right side that controls the Freq parameter, which allows hands-free control of a glistening resonant filter. 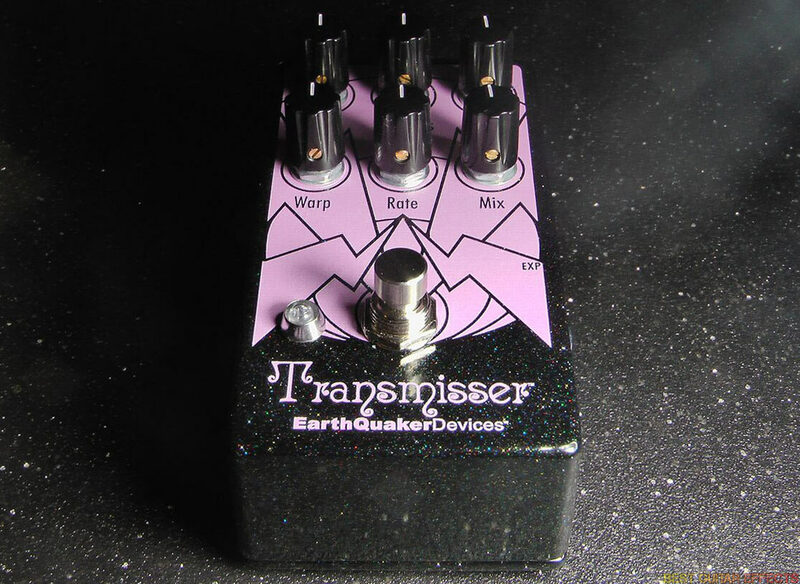 Visit EarthQuaker Devices for more info about the Transmisser. Immediately upon playing my first notes through the Transmisser, I was intimidated by the incredibly complex wash produced. What is going on? Even with the Decay at its lowest possible setting, every reverb tail seemed to last forever, indicating from the get-go that I was in for something worlds apart from even the most out-there reverbs I’ve played. Although this means it might not be replacing any traditional reverbs on the ‘board per se, the zealous experimenter can buy the Transmisser and not feel as guilty about keeping another pedal that might otherwise help mitigate the costs. More pedals are a win in my book. The Warp knob is the perplexing centerpiece of the Transmisser’s parameter set, serving as a slew that fundamentally alters the entire nature of the pedal and way that the other parameters interact with the one another: clockwise for a defined sound, counter-clockwise for more of a wash. As you do this, you’ll notice quite quickly that this also downshifts the pitch of the reverb tail, which sounds terrifying. The applications of this are endless and I almost wish there were another expression out to control the Warp, but that would be an outrageous demand. The Transmisser is affected by a near-indecipherable modulation which grows more frantic the further clockwise you roll the Rate knob. This also modulates the Darkness and Freq parameters depending on where the Warp is set. Cranking the Rate and playing with the Freq reminds me of EarthQuaker’s Spatial Delivery envelope filter, which yielded a similar harmonic purr on its way up or down in resonant frequency. With the Decay knob maxed, whichever frequency you’ve set will actually start to oscillate, but never go beyond a dull drone, adding a whole new element of ambience to long reverb tails. I was also surprised with how well the Transmisser takes any kind of dirt. With an overdrive behind a full wet Mix and the Rate rolled back to a slow yawn, I was treated to a very vocal sounding vibrato. If all you’re looking for is a unique way to add some auditory distance between yourself and the audience, fret not! Even with all of the crazy sounds dipping in and out of the Transmisser’s mood-setting, I couldn’t help but notice that I never once lost the sense of space that justifies calling it a reverb and not something flamboyant, like “Cosmic Embellisher.” If you were so inclined, you could pretty much set the knobs anywhere and become inspired from your first note. In the harmonically dense sense, it reminds me of some high-end shimmer reverbs, only this is the effect I’ve wanted shimmer to be all along. Sorry, shimmer. It’s not you, it’s me. The EarthQuaker Devices Transmisser is both more and less than any reverb: it is an experience. Armed with its reverb and modulations, the Transmisser is a particularly potent sound tool I never thought I needed. It is an effect all its own, a must-have for weirdos and a must-try for normies. Honestly, I can’t think of one thing I didn’t enjoy about the Transmisser. There’s just so much going on that the nuances are hard to keep track of, and the radical expressionistic power of this pedal is undeniable. Maybe in the future EQD will consider a Transmisser 2 with stereo, an expression for the warp, and maybe panning? There’s not much more beyond that that can make it better. Even if you never dial in a normal sounding reverb (and trust me, you won’t,) the Transmisser is well equipped to hypnotize anyone within earshot, and that’s totally worth your dad never understanding what’s happening when you play with it. Try it and explore the universe.